The biggest news from Ford Motor Company at the upcoming 2019 Chicago Auto Show will be the formal introduction of the refreshed 2020 Super Duty lineup, but with a few days until the start of the Windy City show, the automaker has offered up a preview of their newest heavy duty pickups. The current Ford Super Duty lineup was introduced for the 2017 model year, so the vehicle is fairly young, but in an effort to stay ahead of the competition, the Motor Company will roll out a refreshed version of the F-250, F-350 and F-450 for the 2020 model year. This refresh will include some minor exterior changes, more interior technology and, most importantly, more power leading to greater capabilities. The 2020 Ford Super Duty will make its grand introduction later this week, but to get truck lovers up onto the edge of their seats, the Motor Company has offered up some basic details on their new heavy duty trucks ahead of the full rollout. 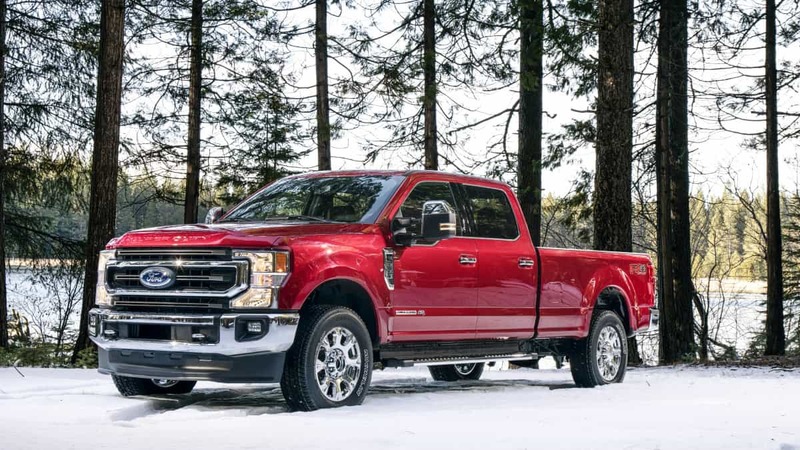 The changes made to the 2020 Super Duty begin on the outside, where Ford has introduced new headlights, a new grille design and a new front bumper, all of which come together to provide a fresh face compared to the current models. There is also a new taillight design, but shy of these changes, the exterior of the 2020 models is similar to the current trucks. From the side, it may be hard to differentiate the 2020 models for many people, but within the truck community and among Ford fans, the refreshed front end will stand out in a crowd. Next, as you should expect with every refreshed vehicle, the 2020 Super Duty is chock full of new technology, including Pro Trailer Backup Assist with the Trailer Reverse Guidance system, the FordPass Connect WiFi system, a Blind Spot Information System with trailer coverage, Pre-Collision Assist with Automatic Emergency Braking, wireless charging and USB-C connectivity and much, much more. The biggest news for the 2020 Ford Super Duty is what you cannot see in pictures, as the refreshed F-250, F-350 and F-450 all come with three engine options. The 6.2-liter gasoline V8 continues to be the “base” engine, but there is a new 7.3-liter gas V8 coming for 2020 that is expected to offer the most power of any gasoline engine in the heavy duty truck segment. Sadly, there are no power numbers included in today’s release, but we can expect the new, larger gas engine to beat the top competitors from Ram, Chevy and GMC. Of course, the 6.7-liter PowerStroke diesel also returns with the promise of more horsepower and torque, but like the gas engines, there are no official power figures yet. As an interesting point, it should be noted that the Ford release points out that the new 7.3-liter gas engine will be the most powerful of its kind in the segment while the Motor Company makes no such comment about the diesel engine. Ford fans expect that the new PowerStroke will knock off the new Ram Cummins engine with 400 horsepower and 1,000 lb-ft of torque, but we will have to wait until later this week for the official power numbers. Finally, the entire 2020 Ford Super Duty range will benefit from a new 10-speed automatic transmission that has been designed and optimized to make the best use of all of the power from the three engines discussed above. This gearbox should help to make the 2020 Super Duty more capable while also making it more efficient. The 2019 Chicago Auto Show opens to the media on Thursday, February 5th and the Ford press conference is planned for 10:30am, so in just over two days, we should have all of the key information on the next chapter in the story of the Super Duty.